WIMA FKP 02 Polypropylene (PP) Film and Foil Capacitors for Pulse Applications. 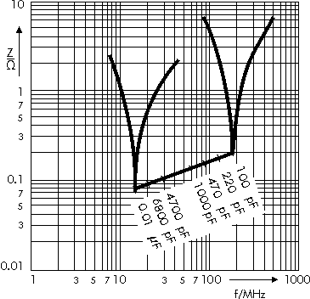 Capacitances from 100 pF to 0.01 µF. Rated Voltages from 63 VDC to 400 VDC. For high frequency applications e.g. Encapsulation: Solvent-resistant, flame-retardent plastic case with epoxy resin seal, UL 94 V-0. Ur = 63V: Utest = 50 V/1 min. Ur > 100V: Utest = 100 V/1 min. Maximum pulse rise time: 1000 V/µsec for pulses equal to the rated voltage. 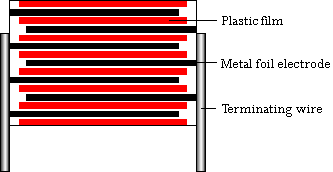 Voltage derating: A voltage derating factor of 1.35% per K must be applied from +85°C for DC voltages and from +75°C for AC voltages. 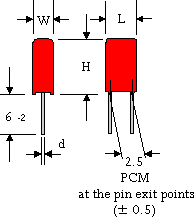 ** PCM = Printed circuit module = pin spacing. Impedance change with frequency (general guide).